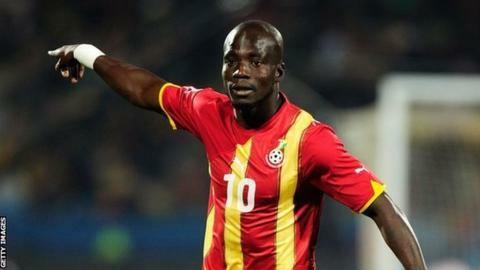 Former Ghana captain Stephen Appiah says current Black Stars players have the right to what they earn when representing the country because "no-one cares when you stop playing". Appiah, who led Ghana to their first World Cup appearance in 2006, will be part of the country's backroom staff at this year's tournament in Brazil, providing a link between the players and coach Kwesi Appiah. And already he has been fierce in his defence of the players after a dispute over their financial demands. Each member of the 23-man squad will earn US$75,000 in appearance fees and another $45,000 if they make it out of the group stage. At the end of the day when the players demand the bonuses they always do well. The figures have led to accusations that the players are putting financial gains ahead of patriotism but Appiah disagrees. "When people hear about money it generates a lot of talk but people don't look at what the players are bringing to the country", Appiah told BBC Sport. "The players don't just play, they draw attention to the country, to Ghana. Those small things put the country on the map." "When we played against Lesotho I got to the stadium Osei Kufour and C.K Akunnor and saw Damba (former Black Stars goalkeeper), Kofi Abbrey and others sweating at the gate. They had been denied entry into the VIP area but these are people who gave their all for the nation," he said. "When you are playing people care about you, when you stop, they just don't care." Despite improving bonuses considerably since the 2006 World Cup, Ghana have struggled for trophies - their wait for success at the Africa Cup of Nations now stretches 32 years - but Appiah insists that it is not for the want of trying. "At the end of the day when the players demand the bonuses they always do well. From 2008 we have always reached the semi-finals of the Nations Cup, this is the third time we have reached the World Cup. We get results. "Everyone wants a trophy but it's not that easy. Are the players bringing results? The answer is yes?" The former Juventus and Fiorentina man, who represented Ghana at the 2006 and 2010 World Cups, is confident the team will back up their financial demands with the right performances in Brazil where they will face Germany, Portugal and USA in Group G.
"We reached the second round in Germany when we were not expected to get out of the group stages and made the quarter-finals four years ago," Appiah said. "In Brazil we will not be a surprise team and that is what will make it difficult but this team have players who can deal with that pressure."